Out of all social media platforms, Pinterest may be one of the most misunderstood. Some people just see it as an online scrapbook of the wedding or house decor ideas, but Pinterest is much than just a collection of ideas. 93% of active pinners said they use Pinterest to plan for purchases and 87% said they’ve purchased something because of Pinterest. Thus, it can become a powerful platform to bring awareness to your business. The first thing you need to do to optimize your Pinterest account for eCommerce is to convert it into a business account. By doing so, you’ll be able to get access to more advanced features such as powerful analytics and the advertising platform. Also, once you have a business account, you’ll be able to run ads on Pinterest. If you already have a personal account for your business, you can easily convert it into a business one. Just visit business.pinterest.com and click on “convert your existing account.” Then, fill out the form, and, last, verify your website. Verifying it will prevent any other business from creating a Pinterest account with your brand name. While adding pins to your boards, keep in mind that each one of them should have a description including your target keywords. Using them will guarantee your pins are shown for the right searches. To strengthen your presence on Pinterest, you’ll want to have as many people pinning your products and content as possible. To accomplish this, you have to optimize your site and make it pin-friendly to encourage your visitors to take action. Installing a social sharing widget like the ones offered by SumoMe or ShareThis can help remind your visitors to share products or content they like. Additionally, add the Pinterest “Save” button or, even better, the hover Save button to encourage pinning. Using the latter will show the Pin button once a user hovers over an image. Your images should also be optimized. Their size is important. If the images are too small or too big, they can easily get distorted when pinned. Opt for vertical images with 735 x 1102 pixels which contain less than 30 percent background. Curalate states that those types of images are repinned the most. Surprisingly, they also state that brand images without faces receive 23 percent more repins. Last, colour saturation seems to be important for pinners. Colourful and bright images get more engagement and repin than dull and dark ones. Buyable pins will allow you to sell your products right within Pinterest without having to take users to your website to make a purchase. This is great, considering that the average order value of Pinterest users is $50 higher than other social media platforms. Also, buyable pins convert twice as much as normal pins that lead to product pages. Thus, having them can boost sales coming from Pinterest. Not taking potential customers to your site may seem like a bad thing, but it does have its benefits. By reducing the steps in the selling process, you’ll make it easier for customers to make a purchase. With buyable pins, users just need two easy clicks to add a product to their bag and check out. The best part is that using buyable pins is free, but you can always promote them to increase exposure to your products. If you use a website platform like BigCommerce, any product your visitor’s pin will become a buyable pin. Pinterest simply uses a product feed which is matched with existing pins to find out which products are already on Pinterest. The platform recommends testing pins in secret boards to find out what types of pins perform best. Rich pins offer more detailed information about the content being pinned. For instance, product-rich pins show real-time pricing, availability, and the store’s name. So, pinners can easily see where to buy products and get to product pages with a simple click. They can also get price notification alerts when the price of a product changes. Now that we have buyable pins that allow users to buy products without getting out of Pinterest, product-rich pins have been slightly replaced. However, we can still use rich pins to provide more information about articles, recipes, and apps. For articles, this type of pins shows the article’s headline, author, and story description. For apps, rich pins show an install button that users can easily click to download apps. Rich pins will not only give your pins more visibility, but they will also increase your click-through rate or CTR. Target reported a 70% increase in traffic from Pinterest when they enabled Rich Pins. Last, make sure to use canonical URLs for your product landing pages. This can be done by adding a canonical URL tag in your site’s link. Using Pinterest’s advertising platform can be just what you need to power up your eCommerce marketing efforts. Besides reaching your target audience, you’ll also be able to reach people related to your target audience. 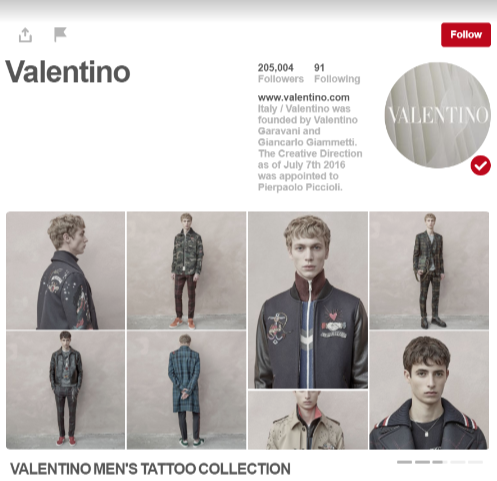 When someone saves a promoted pin, other people can see that pin in their Pinterest feeds. This will multiply your exposure and increase your chances of conversion. Pinterest offers three types of ad campaigns with different goals: awareness, engagement, and traffic. As the name implies, awareness campaigns are just meant to get your brand seen by as many people as possible, and advertisers pay per 1,000 impressions. Engagement campaigns will help get people to interact with your pins either by repinning, clicking or doing a closeup. Last, traffic campaigns will help you drive traffic to your site to convert visitors as they land on your product page. The steps to create a campaign are pretty standard. You just need to have a business account, choose your campaign’s goal, pick a pin to promote and select a target audience. Once your campaign is set up, make sure to add a Pinterest tag to your site to be able to track conversions. Watch your campaigns carefully to monitor results. See what types of posts are creating engagement to boost those and replace any pins that are not performing well. Vertical, long pins usually perform better than landscape ones. As with any other social media platform, Pinterest has its own way of working. Its users engage and interact with content differently from the way they would interact on Facebook, Instagram, or Twitter. Wise retailers have to be mindful of the differences between social media platforms to tailor content accordingly. By optimizing your business profile following all the guidelines discussed above, you’ll have a better chance of crushing the competition on Pinterest.